This is not a finished project. Not even nearly. But I think it’s about time I shared what I have, and now is the perfect time since it’s the topic for this week’s Chit Chat Across The Pond segment on the Nosilla Cast. It all started with a photo of a small pile of bricks, all that remains of a second railway bridge across the river Nete in my home town of Duffel (yes, the place the coats and bags are named after) in Belgium. On the small pile of bricks was a small sign with a potted history of the former bridge. It mentioned that it was Line 25A, intended as a faster express route between Brussels & Antwerp. The existing line between Brussels and Antwerp (two really, Lines 25 & 27 which run parallel most of the way) is the oldest railway line in continental Europe. I find it somewhat ironic that the line which was once considered too slow now hosts high-speed international trains to Cologne, Paris & Amsterdam. But perhaps it’s fitting that a large section of the bedding was used to build the E19 motorway between Brussels 7 Antwerp. It was not the kind of high-speed traffic the line was built for, but it does definitely facilitate some serious speed between the two cities now! Having taken the photo, and read the notice, I fired up Google Earth, and was shocked to see that although there was no trace of the line to be seen at ground level, the story was quite different from the sky! The course of the old line is exceptionally clear on Google Earth. At the time this excited me enough to blog about it, so rather than repeating myself, you can read my original post for more details and some pictures and screen-shots. After having seen the outline of the line on Google Earth, I hit the Googles and started looking for more information on it. I stumbled across a Flemish site which lists the route of all the former and current railway lines in Belgium. It was just a list of stations for each line, but that was enough to get me going. Soon I realised that just about all the lines could be found with the help of Google Earth, so I started mapping them by adding paths in Google Earth. Then I started adding in the stations I could find as place marks too, and before I knew it I was documenting all if Belgium’s railway history using Google Earth. Initially I had a hard time finding all the stations, but, with the help of wikipedia.nl and the route diagrams they have of most of the past and present lines in Belgium I’m really starting to nail things down (e.g. the diagram for Line 125A which I’m currently mapping). I’m not done yet, but I’m making very good progress now. I’d probably be Finished with Belgium by now, were it not for the fact that I got somewhat distracted by Irish railway history, and started mapping the former Irish lines too! I’ve been at this for about a year and a half now, it could well take me another year to finish, but, I’m going to share what I have so far, the download links are at the end of this post. Just some notes on the files for download. They are KMZ files, which means you need to open them with Google Earth. The Belgian one in particular has been very carefully broken in to logical nested folders. You can use the check-boxes next to the folders to filter what you see to prevent information over-load. There is a LOT of information in these files! It also makes things a lot clearer if you turn off “Roads” in the “Layers” tab on the bottom-left of the interface. Also, the colours have meaning. Blue and purple mean current lines and stations, the darker the blue, the more sure I am of the exact positioning, and purple means I’m not sure of the numbering. In some places, particularly the very large yards and the massive harbour complex in Antwerp, it’s very hard to match the lines that I know are there with the maze of track-work seen on the ground. The more I work on it the more sure I get, and the amount of purple is constantly decreasing. I hope to get rid of it all before I’m done. The two other colours you’ll see most are green and yellow. They both refer to past tracks and stations, with green being for ones I am sure of, and yellow for ones I’m less sure of. There is also orange, which means it’s a former line or station and that it’s location on the map is a total guess. Finally, there is white/grey, this is for future lines that do not exist yet, or can not be seen yet on Google Earth because the images are always at least a few months behind, often even a few years. There are also a few places where the imagery has been updated to a much higher resolution since I mapped the lines, so the lines are still in light blue, and not perfectly positioned. The Irish one is much more of a work in progress, and I haven’t yet decided on the best folder structure to use so, it’s much harder to filter the data meaningfully at the moment. Because Belgium nationalised it’s line much earlier on the system has a much more defined structure with all the lines having numbers, and all having belonged to the NMBS/SNCB. In Ireland the lines were not nationalised until much later, and there were many companies in existence, constantly merging and being taken over and renamed. A single station could easily have belonged to 5 or 6 companies, particularly in Northern Ireland. Excellent work Bart. Some strong parallels there with my own local area. Although I knew considerable history of an historic line in the area, it was the discovery of an old bridge support in a nearby suburb that prompted me to learn even more. Much of the old line’s track bed is also now motorway! The coolest part for me, though, is that every weekday I drive along the old track bed as I head to the present day station to catch the train into the city. I was also planning on Google-mapping the line, but I see our locl historical society have now published a book on the railway, so I must check that out. I also have memories as a kid on holiday with the family, spotting old rail formations in the area where my father grew up. The difference for him is he remembers when the line was operating. I have to admit to looking forward to looking at this when i get home from work. I think it was your last post that prompted me to look at the line that passed behind my parents house. It is Long since broken up, but you can almost track between places where there are still signs and where the signs are long gone. That’s a cool idea for a project man, fair play. This is an excellent project Bart which will provide much needed information for present and future generations. I wondered if you may be able to help me, or do you know any contacts who would have a good knowledge of Belgian Railways in 1943 and could assist I am especially interested in specific stations, general locomotives and rolling stock for this period , plus routes from Antwerp to Brussels, Brussels to Tournai and then Tournai to Rumes. My father was an Allied airman trying to evade capture after his aircraft had been been shot down. He travelled this way. Background information and specific details would be most hopeful. I’m really sorry to say that I don’t have any railway contacts in Belgium at all. I’ve gotten all my information from the web, mostly from the Dutch-language version of wikipedia (nl.wikipedia.org). I can help you out with line numbers though. In 1943 there were three lines from Antwerp to Brussels – you had Lines 25 & 27 which run right next to each other almost the entire way, and line 25A which had a totally separate course and closed in 1969. The stretch from Brussels to Tournai is a little bit harder to tie down. The most direct route form Brussels to Tournai (Doornik in Felmish) would seem to be to take Line 96 from Brussels South to Halle, and Line 94 from there directly to Tournai. However, that would require crossing the centre of Brussels, which might not have been an option. Another logical route would seem to be to follow Line 50 from the North of Brussels to Denderleeuw, and then Line 90 from Denderleeuw to Ath on Line 94. The final section from Tournai to Rumes could only have been along the now closed Line 88A. This line opened in 1883, and the first section of it was not closed until 1950. The vast majority of these possible routes is still open today, with three exceptions. The most obvious two being the complete closure of line 25A, and the complete closure of the 12.6KM section of Line 88A from Tournai to the Belgian border in Rumes. The other exception is a section of Line 94 from Mark to Ath. In 1985 a new and much straighter route was opened between Mark and Ath, and the original route that would have been used in 1943 was closed. I hope that’s of some help, and I wish I could do more for you. The very best of luck with your research, and if you ever do write up what you find out, I’d really love to read it. Excellent work Bart. Some strong parallels there with my own local area. its really good. I came across your blog and download of BE rail while diving into the history of a great grand uncle who served in the 1st Railway Section, Australian Imperial Force in Belgium in WWI (1997-1919 so 3rd Battle of Ieper). The official diaries of the Section (http://www.awm.gov.au/collection/records/awm4/subclass.asp?levelID=1661) indicate that they operated a line from Bruges, Rexpoede, Rousbrugge – Haringe (former spelling), Wayyenburg, Proven, and possibly thru to Poperinge. I’ve checked out some military maps of the day to locate some of the depots and stations. Eg. Ordinance Survey October 1917 http://lt1.mcmaster.ca/ww1/wrz4mp.php?grid=19&map_id=369&view. Downloading your file to Google Earth and superimposing it against the stations has helped a little but its obviously missing. I believe that maybe because it crosses from France into Belgium and more than likely built specifically to support / supply Ieper and hence ripped up after the war. I’ll keep dinning and let you know what I find. Anyhow, from what you are saying, I think you are describing the general area around what later became Line 76. The place names stood out to me because this has been the most troublesome line in my entire project! I have a much more recent version of this project which I haven’t published yet, and one of the lines that I gave a lot of attention to was Line 76. I’ll email you an updated copy of my file when I’m done with this reply. “This line was hurridly built by the Belgian military during WWI to supply the front along the rive Yser. After the war, in 1920, the Belgian State took over the line and opened it up to passenger and goods traffic. In the 1930s the NMBS did not want to pay to renovate the bridge over the Yser, so they closed the section between Beveren-Stavele (originally Klein Leisele) and Roesbrugge and split the line into two goods lines. I’m not sure of the exact date that this happened. The station are all listed as closing to passengers in 1934, but some sources list the date of the closure of the bridge as 1932. Perhaps the bridge was initially only closed to goods traffic, perhaps the dates on all the stations are wrong, or perhaps the date for the closure is wrong. 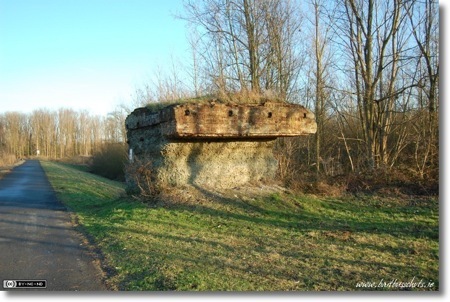 The two spurs, from Adinkerke (later called De Panne) to Beveren-Stavele, and from Roesbrugge to Poperinge, remained in use for goods traffic until 1942, when the occupying German forces ordered the line closed, and dismantled. What became Line 76 only started in De Panne near the French border, so to get from Brugge to there parts of Line 66, Line 63, and Line 67 would have to have been included. If you started in Brugge and headed south on Line 66 you could have take Line 63 in Torhout to cut across to Kortemark, where you could have taken Line 67 all the way to DePanne, where you could take Line 76 via the front lines to Poperinge. Much of that route still exists today, but you’d have to take a short detour via Lichtervelde because Line 63 is gone, removing the shorter direct link between Torhout & Kortemark. As I say, I’ll email on the latest version of this project to you. Hopefully it helps you put a few more of the pieces together. Thanx for your work in KMZ-files. Not only the one about railways, but I enjoyed the coalmines and Antwerp too. I have completed your file with the lines in the south of Belgium and some lines of SNCV. If you are interested in thes files please contact me. Only just now I found your work on the Belgian railways. Very interesting, a really great piece of work. I once started myself with the area around Charleroi, and some other lines. But the hard thing is to keep going and finish it… I did not. What I miss in the file that I downloaded is the original line La Louvière – Mariemont – Bascoup. It has intrigued me since I read about its existence, thirty years ago, and it can be traced fairly well on Google Earth. Somehow, I never got to visiting it although I planned to. It’s just a detail. Thanks for sharing your work.